This free Children’s Church lesson plan was first written for elementary aged students. It covers the story of Noah and the flood. This material could also be used as the Bible lesson for children’s Sunday school. Be sure to consider your own ministry context and modify it as needed. Please leave any feedback or suggestions for improvement in the comment box at the bottom of this page. We also have a preschool Noah’s Ark Lesson. Learning Objectives: After this lesson, the children will demonstrate an understanding of the flood by telling the story to a partner. Bible: Genesis 6:5-22. There is a detailed explanation below to help bring out some of the important parts of the story. Worship Music: Use the Noah And The Flood Songs (PDF) to lead the children to sing before the Bible lesson. You can also browse some other kids worship songs. The story of God’s rescue of Noah is used elsewhere in the Bible as an illustration of how Christ saves his followers from God’s final judgement. This can be an opportunity to remind children of the great salvation promised in the Gospel. Animal Charades – Have the children take turns acting like different animals and having the rest of the children guess which animal they are. “Have you ever done something wrong? (allow for responses) Of course you have! We all have. Have you ever done something right? (allow for responses) Do you follow God and what He wants you to do? Can you imagine if you and your family were the only ones on earth who followed God. That is exactly how Noah and his family felt. Have the children open their Bibles to Genesis 6:5-22. To help them find it, use the following questions. Answers are in italics. Read Genesis 6:5-22 (NIRV) aloud to the children. The Lord saw how bad the sins of man had become on the earth. All of the thoughts in his heart were always directed only toward what was evil. Here is the story of Noah. Noah was a godly man. He was without blame among the people of his time. He walked with God. Noah had three sons. Their names were Shem, Ham and Japheth. The earth was very sinful in God’s eyes. It was full of mean and harmful acts. God saw how sinful the earth had become. All of the people on earth were leading very sinful lives. So God said to Noah, “I am going to put an end to all people. They have filled the earth with their harmful acts. You can be sure that I am going to destroy both them and the earth. “So make yourself an ark out of cypress wood. Make rooms in it. Cover it with tar inside and out. Here is how I want you to build it. The ark has to be 450 feet long. It has to be 75 feet wide and 45 feet high. Make a roof for it. Leave the sides of the ark open a foot and a half from the top. Put a door in one side of the ark. Make lower, middle and upper decks. “I am going to bring a flood on the earth. It will destroy all life under the sky. It will destroy every living creature that breathes. Everything on earth will die. “But I will make my covenant with you. You will enter the ark. Your sons and your wife and your sons’ wives will enter it with you. Noah did everything exactly as God commanded him. The world had become evil. God has feelings. It saddens Him when we don’t follow Him. God was pleased with one man on the earth. One man! Only one man and his family followed God. God was so upset with how the people of the world were, He decided to wipe them off the planet. How would you have liked to have been Noah at that time? God has just told him that the whole world was going to be wiped out! He hasn’t said anything yet about saving Noah. •	God wanted to save Noah. So God gave Noah specific directions on how he could be saved. He had to build the ark. He had to follow God’s directions – every little step – in order to be saved. •	God fills Noah in on how He’s going to destroy the earth. He’s going to send a flood. Noah did everything EXACTLY the way God told him. When was the last time you did EXACTLY what you were supposed to do? The first team to 10 – wins! Split the children into partners. Have each child tell their partner the story of the flood. Need More Ideas? 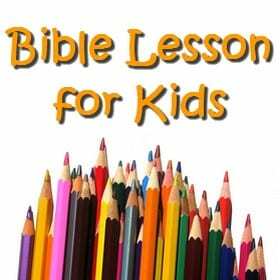 Then check out our Kids Bible Trivia or Free Sunday School crafts. I like the herding the balloons with sticks idea–but I think it might be even more fun to have each child herding a PAIR of balloons into the ark! the best part about the story is that the animals came on their own. no herding required. Tony Kummer (Editor) reviewed & updated this page on : June 30, 2011 at 11:36 am. All our content is peer reviewed by our readers, simply leave a comment on any post suggest an update.